I am trying to tell myself that I have to stop cosplaying. I was, I have been doing so but after all I can’t stop. 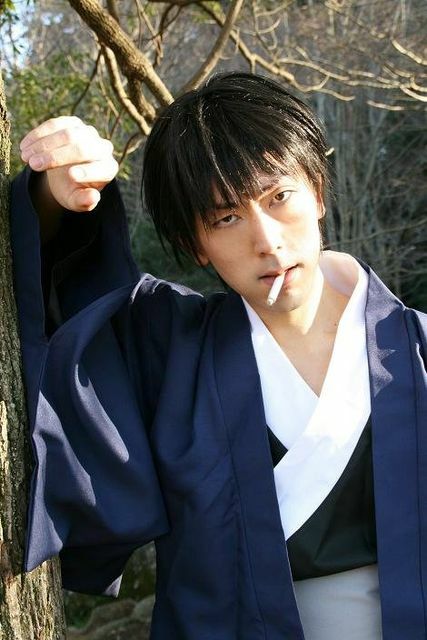 A new year has come, and this is going to be my first cosplay in 2010. Oh someone, you should stop me! Didn’t I say truth is stranger than fiction? Yes, we never know what will happen in the future. Actually a lot of bad things happened to me last year, but since the end of the year, glad things are coming to me. This is one of them. 人間生きてればいい事も悪い事もあります。Can I say like Easy Come Easy Go? 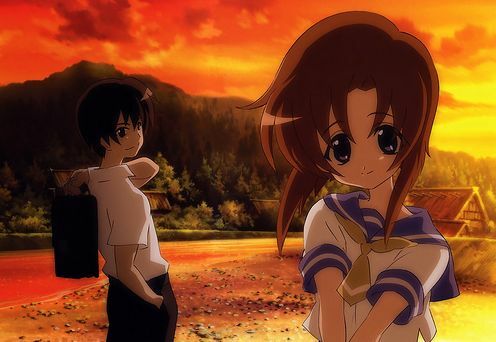 In fact, when I was a beginner I cosplayed Higurashi. But it was a long long time ago so I was a bit surprised when she asked me to cosplay this series. My part is the hero, Maebara Keiichi who transfered to a small village named Hinamisawa. She cosplayed Hojo Satoko who is a younger sister of the classmate he’s never seen. And her friend did the legendary bishoujo, Ryuugu Rena. How legendary? Please watch the anime or you’ll see. Before I start this entry, I must say I am terribly sorry that I haven’t blogged for a long time. In fact my computer’s broken, so I hadn’t been able to do internet. On no, it was really inconvinient. No internet, no life. I fully realised it. Okay so let’s get going. I am not sure if this is because a new year has come or not, but I often see most weekly magazines saying like Must-read topics for salarymen in 2010, or something like that on the cover pages. That is, they are talking about some tactics in order for salarymen to get through this recession. Yes, they might be afraid of being dismissed. In other words, they are always under the pressure of laid-off. リストラ[risutora] is the scariest word for most salarymen. “Could it be happening to me tomorrow?”–that might be what they are screaming inside. No no, this is not what I want to mention here. Come to think of it, there are quite a few classification for salarymen. First of all, please know we abbreviate it as リーマン[reeman]. If you happen to be a BL fangirl[fujoshi], you might be sure of a genre named リーマンもの[reeman mono], which means a love story by two salarymen. Actually, the salarymen’s circle could be broader…than you think. Let’s see how it is together. a. ヒラリーマン[hira-reeman]: A salaryman with no title. ヒラ[hira] stems from 平社員[hirashain]. 社員[shain] means an employee. You can also say 平 or ヒラ to mean the same. There is also a funny saying, 社会の底辺[shakai no teihen] or bottom of the society. That is, the lowest rank at the company. 私は社会の底辺にいます[watashi wa shakai no teihen ni imasu] implies I am just a salaryman with no title. b. チャラリーマン[chara-reeman]: A lazy salaryman who is not interested in the work he is engaged. Also his looking is so shabby that people might think he is a host at the nightclub. チャラ[chara] stems from チャラチャラしている[chara-chara shiteiru] or fool around or play around. Omg, that is me! c. チャリリーマン[chari-reeman]: A salaryman who goes to work by bike. You think most salarymen take a train, don’t you? Actually there are some salarymen who use a bike. That’s because the gasoline price goes up? In fact, I am a チャリリーマン, too. It is so healthy and enviromentally good, isn’t it? チャリ[chari] stems from チャリンコ[charinko] or a bicycle. If you are going to school by bike, you can say チャリ通[chari tsuu] which means チャリンコ通学[charinko tsuugaku]. 通学[tsuugaku] means commute to school. d. モバリーマン[moba-reeman]: When you are on the train, you see a salaryman using a computer on his lap, don’t you? モバ[moba] stems from モバイル[mobile]. That is, a salaryman who always carries a computer with him so as to work anytime, anywhere. But this モバ mostly means a computer rather than PSP or mobile phone. e. マルガリーマン[maruga-reeman]: A shaved-head salaryman. We say 丸刈り[marugari] to shave a head, and 坊主頭[bouzu atama] or a shaved-head. 坊主 means a monk. Before, when a man shaved his head it used to mean his apology for what he did. 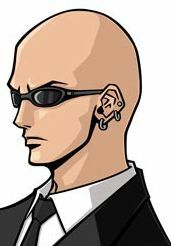 But because of some cerebrities like David Beckham or whoever, a shaved-head style has become popular among young people. When I was a student at university, I used to see many classmates following the fashion. However, a shaved-head might look so scary and wild that the career advisors didn’t encourage us to do so. Meanwhile, there are some people who like because it looks so fresh and manly. Is there someone like that in Final Fantasy 7? j. ビフォア９[before 9]: If you can finish the work early, there is a time you have to join a party with someone you don’t like. In this way, your schedule wouldn’t go as you plan. But you can enjoy your time before you start to work, which means before 9 o’clock. Go to gym, take an English lesson, do internet…But I wake up at 6:30 and leave home at 7:00, so I have never enjoyed ビフォア９（笑）. k. 駅モニ[ekimoni]: JR Higashi-nihon food business started a new service for people who go to work without eating breakfast. 駅モニ[ekimoni] is an abbreviation of 駅ナカモーニング[ekinaka morning] or breakfast inside the station. Because of this service, some fast food restaurants or coffee shops started to open earlier than before and get more sets. Also, we say 朝マック[asa-mac] to have breakfast at MacDonald. Come to think of it, I still remember they got a coffee for free in the morning. l. 重役出勤[jyuyaku shukkin]: You wouldn’t have to go to work that early if you are a higher-rank person like an executive. 重役[jyuyaku] means an executive. They might be able to go to work anytime they want. And no one can complain about it…sigh, I want to do 重役出勤. If you are still a teenager, above has nothing to with you, yet. But after you started to work, you might be classified as one of them? But even that, I assume there are some unique sayings in English because of the difference of the cultures. I only know five-o’clock shadow in English, but we do not have the equivalence of it in Japanese. ５時の影なんて言わないですし…似たような表現もありません。So if you know something like this, please teach me. I want to know! It’s been quite a while since I last introduced a term, and this is the first one this year. I think I was going crazy for cosplay. Nah I have been and will be. When I was an elementary school student, I learned about this for the first time. It was during Japanese class, and maybe we were reading a novel or something. In the novel, there was a dove speaking to someone, and the teacher said this is called 擬人化[gijinka]. As you may imagine, gijinka means treating an object(not a human being) like a human being. Doves are not human, but let them speak languages just like human beings. In this way, anything in this world can be like human beings, and behave as we do. Upon hearing this, it reminds me of one of the most well-known Japanese folk tales, Crane’s Reward[鶴の恩返し]. An old man saves a crane that had been trapped, and the crane visits him, transforming into a human being. Needless to say, she has transformed into a beautiful lady in the story. Hey, we have seen something like this in Kanon, haven’t we? Mostly, humanized objects are supposed to be in the shape of bishoujo(pretty girls) or bishounen(handsome boys). We call that 美少女化[bishoujoka] and 美少年化[bishounenka] respectively. 化[ka] means -nize in English like “Americanize.” Also we can say 萌え擬人化[moe gijinka] in general. As we have seen a lot of examples in this kind of genre, there are two types of 擬人化 when it happens to animals. One is a perfectly humanized animal like Sawatari Makoto in Kanon(she is actually a fox spirit). The other type is also humanized, but some parts of the body such as the ears or the tails stay the same. For example, Holo in Wolf and Spice, Chesha cat in Pandora Hearts, all the civilians in Utawarerumono, or all the characters in Lamento. Like the folktale I mentioned , it is not exaggerating to say 擬人化 is a common way in literature. Now, 擬人化 can happen to anything you see. Even if it is not a living thing, it doesn’t really matter. Trains, ships, airplanes, fleets, or even insects like a beetle! But, 擬人化 requires some imagination because you have to bestow life to an object and treat it as a human being. So…you know what I am going to say, don’t you? Yes, when it goes to people who really love to hallucinateimagine like fujoshi, things are going to be crazy. Before I explain this, let me tell you how I was surprised a while ago. When I went to a certain bookstore, I saw a really awesome doujinshi[fan-made comic]. It was Nintama Rantarou[忍たま乱太郎]. 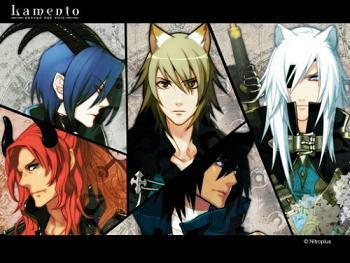 But it was totally different from the original in the sense that all the characters were depicted as bishounen. 見分けがつかない！どれが４年生でどれが５年生なんだよ！As you may know, the original character design was quite far away from anything bishie-like, however, in this doujinshi, they all looked tall and handsome. The same goes to Keroro Gunsou[ケロロ軍曹], アンパンマン[Ampan man], and ドラえもん[Doraemon]. All the frogs in Keroro Gunsou have become gorgeous guys, and BL starts…す、すご過ぎる…腐女子の妄想ってすごいよね（笑） Anyway, characters like Nobita or Gian were humans in the first place, so we say 再擬人化[sai-gijinka] to make a character more fabulous than it actually looks. This delusion finally “invaded” some countries. Yes, it is Hetaria[ヘタリア] which means 擬人化 for countries. 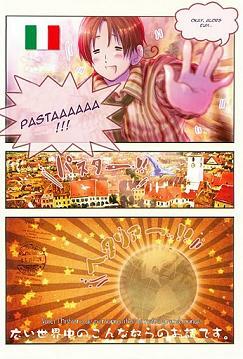 All the characters’ names are that of a country, and they call each other like, “Hey Italy!” or,”Oi, Japan!” The funny thing is characteristics that represent each country. I mean…Japan does not say things honestly. When he says, “I will be sure to think about it postively,” that means “No.” That’s well put. And fujoshi loves to make a pair with two things no matter what it is. Once again, even if it is not a human being, they don’t care. Ameica is top[攻め] and Japan is bottom[受け], or German is top and UK is bottom…whoa, I don’t understand it at all. When it comes to gijinka of Japan’s railway[鉄道擬人化], things will be more complicated. It’s all Greek to me. But, can I just say that of all the airlines I like LAX as top and JAL as bottom? By the way, this fujoshi is explaining about gijinka in these pictures. Do you understand what she is talking about? UK is a beautiful man. This is gijinka, or to humanize a country. He said,"Don't trade with anybody else but me!" Where would you feel loved in any place but mine? No wonder Japanese anime conquers the world. Because the otaku imagination and fujoshi delusion are everlasting. あけましておめでとうございます! A happy new year everyone! How was your 2009? I had so much fun with you. And I even cosplayed with the guests from other countries, I am proud of it. Well, I think I will keep cosplaying this year, too. Oh can I? Resolution? Umm…okay, get Nagisa Kaworu’s plugsuit, cosplay sweet pool, and travel abroad to experience a cosplaying event such as Otakon in U.S, EOY in Singapore, or Japan Expo in Paris.